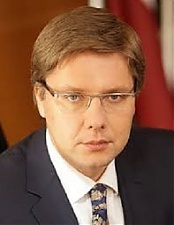 Officers from the Corruption Prevention Bureau (KNAB) are carrying out a search at the offices of Riga Mayor Nils Usakovs (Harmony) today, according to information obtained by LETA. According to LETA sources, the searches are being carried out in Usakovs' offices, as well as his residence. The KNAB informed LETA today that it is carrying out ''operational activities'' at the Riga City Council today, and that it will not comment on this in any more detail at the moment. A search was also carried out at Usakovs' residence on Bergena Street in Riga today. As LETA has observed, Usakovs is currently inside the residence together with KNAB officers. Usakovs' automobile and driver is also parked outside the residence. Shortly after 2:00 p.m. this afternoon, Usakovs' wife Iveta Strautina-Usakova exited the residence and went to the garage accompanied with most likely a KNAB officer. LETA was able to question the head of the Riga City Council's Legal Department, who said that he is not competent answering any questions on what is happening at the City Council at the moment. Meanwhile, the head of Harmony's Saeima group Janis Urbanovics told LETA that he does not know anything about the searches. He said that he has unsuccessfully attempted to contact Usakovs. Urbanovis expects an explanation from investigators, and hopes that all of this is just a misunderstanding.